You never forget your first. I don’t know how many shows there are that deal with the early years of superheroes, but I am never going to escape thinking of them as another Smallville. Fortunately, the comparison is not always accurate. Gotham is the story of how Bruce Wayne, the young boy whose parents were gunned down right in front of him, becomes Batman, the protector of his city and one of the most iconic superheroes ever. It also tells the story of Jim Gordon, the man who eventually becomes the city’s police commissioner and one of Batman’s most stalwart allies. Lastly, it tells the story of how Gotham, the city, became the way it is, filled with freaks and monsters and other villains. I still remember watching the first episode. It was so very campy, wooden, and obvious, it very nearly lost me. And yet, I was just a little bit intrigued. It just barely fell short of annoying me too much, so I kept watching, and added it to my weekly lineup. It took a few episodes, but it grew on me, found its footing, and the quality of the show has been improving ever since. Seriously, comparing the show as it began to how it is now is incredible. It’s like that one time as a teen when you don’t see your friend all summer and then you meet them again and they’ve grown three feet in three months, obviously the same person, but whoa, they are not the same as they used to be! 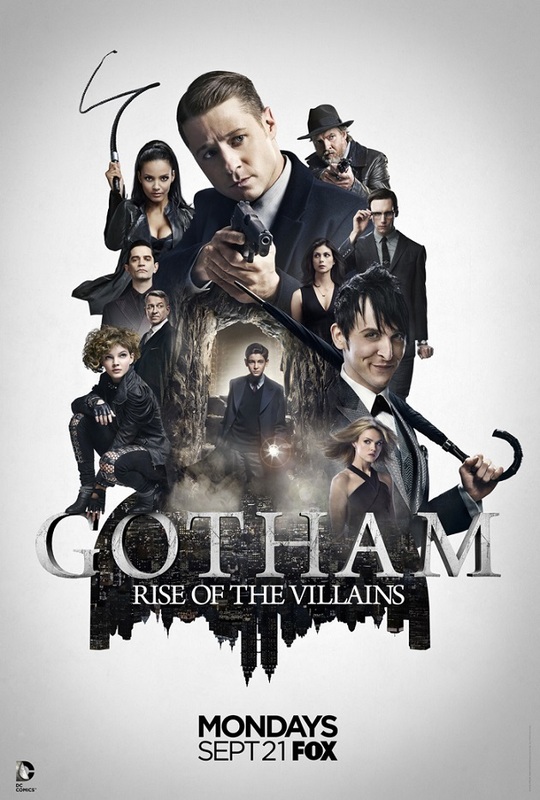 Of course, in this case, I was able to watch Gotham “grow up” week after week, and I have enjoyed it. Gotham‘s best strength is it’s characters. We can forgive a great deal, I have found, if we can love the characters enough. I think that might be why I made it past the first episode, because I liked them, and now I’ve seen them go through some incredible developments. Gordon, for instance, began as an idealistic cop who was willing to stand alone against everything wrong in the city, a zeal that eventually took him down a darker path, which he only recently came back from. Much like Batman, he is always facing his inner demons. Bullock was a beaten, defeated soul at the start, but his fire was rekindled, and he’s grown into a leader, and that’s even when he’s largely been Gordon’s sidekick. Oswald Cobblepot, the Penguin, has risen and fallen several times. Alfred hasn’t grown so much as he has endured for his young charge, Bruce. And, though Gordon has often been the lead of the show, it has continued to follow both Bruce Wayne and Selina Kyle on their intertwined journeys towards becoming Batman and Catwoman, one of the most classic couplings in superhero history. All that said, it shouldn’t need saying that what really carries the show is its plot. We love the characters, but we also love what they go through, and how they become who they’re eventually meant to become. The story is intricate and has so many threads to follow, yet they don’t get tangled up. It’s “rich,” not “overwhelming.” There’s action, intrigue, genuine suspense, triumph, and tragedy as the line between sanity and madness gets bent and blurred. I also like how the show is always easing us into the more fantastic elements of things. Unlike other shows (cougharrowcough!) it doesn’t leave the realism behind. There are rules even when dealing with madness, and the mad science and supernatural elements so prevalent in the DC universe aren’t given free rein in Gotham. The envelope for suspension of disbelief is pushed, not destroyed. Not to make the show sound “perfect,” though. It can get a little repetitive, as Gordon is always dealing with his inner darkness, the villains are always deposing each other, and Bruce, to be kept relevant, keeps getting kidnapped and keeps dealing with secret organizations. I also dislike how so much of the show, in showing us how we get to the future, is inheriting everything from the past. Gordon defends Gotham like his father, Selina is a thief like her mother, the future Scarecrow gets it from his father, etc. It’s poetic, perhaps, but leaves little room for the characters’ own originality. Heck, the more the series progresses, the less the idea of what becomes Batman originates with Bruce. It should be his idea, his desire, and his drive that creates the Batman. Instead, he gets more and more of it from others, starting with his father’s inspirational example but drawing from his enemies as well, what they do and what they want him to do. Yes, there’s someone evil out there who wants him to become Batman, an idea, I think, they have not entirely thought through. Also, I know some people loved coupling Gordon up with Leslie Thompkins, but I was never a fan of it. I just couldn’t figure out that relationship, not where it came from, not how it worked. Flaws notwithstanding, there is a reason I’ve kept Gotham on my weekly lineup. I like it, a lot. I enjoy the characters, the plots, the action, the intrigue. Three seasons done, and still it keeps getting better and better. Only time will tell if they can keep that up all the way to the end, and I’m looking forward to how the characters continue to develop. Gordon, especially, needs to become more restrained and lose that tendency he has to focus only on one thing, the matter at hand, if he’s to be a proper commissioner. 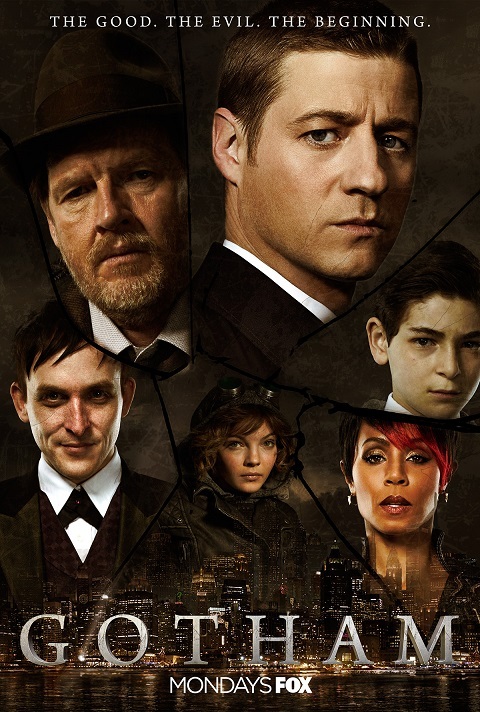 Rating: I give Gotham 9 stars out of 10. This entry was posted in Tuesday Review, TV Shows and tagged Bruce Wayne, Gotham, James Gordon, Jim Gordon, Penguin, Selina Kyle. Bookmark the permalink.